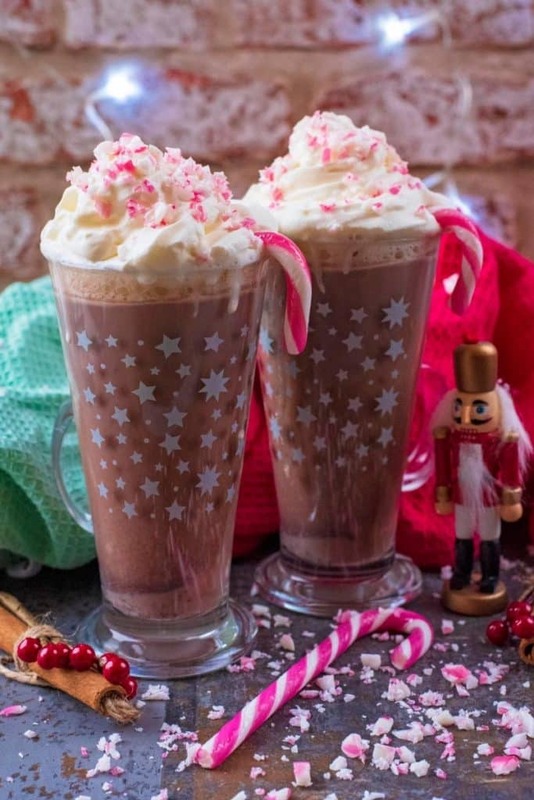 A warming drink, chocolate and candy canes – could this be any more festive? This lightened up Peppermint Hot Chocolate has less sugar than most and that hint of peppermint is sure to get you in the festive mood. Kids will love to decorate them too. Whilst we love relaxing at the end of the day with a nice glass of wine, there is just something about a warm mug of hot chocolate that fills us with joy and takes us back to being a kid again. Settle down on the sofa on a cold winter night with a mug of something that whole family will love. Peppermint is such a classic Christmas flavour and once though candy canes hit the store, you know the festive season it here. 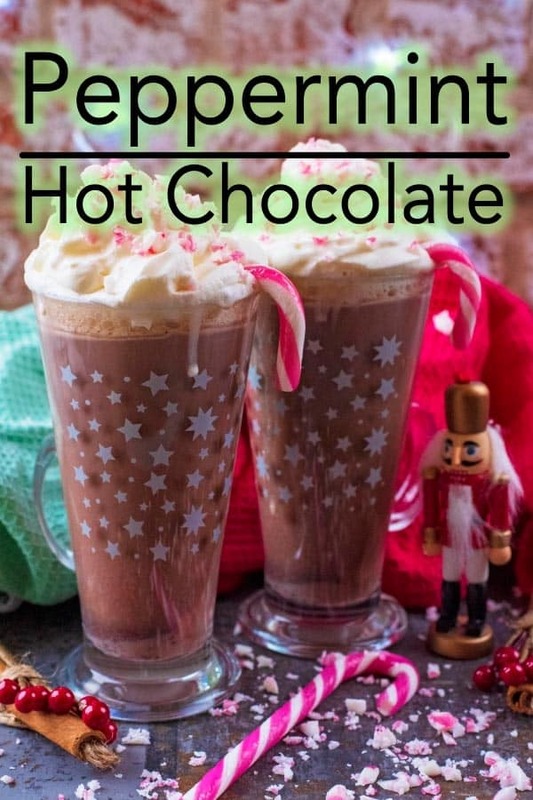 Mint and chocolate go so well together, this peppermint hot chocolate will have you in the festive mood. Whilst hot chocolate is usually a bit of an indulgent treat, in the winter we like to have it quite a lot, especially around Christmas time,. So it’s good to find ways to lighten it up a little. We use a mixture of skimmed milk (you could still use semi-skimmed, whole or even nut) and coconut milk so you get all of the creamy flavour without a lot of calories. Plus, we like the little hint of coconut flavour in there. We used just a little bit of honey to sweeten this hot chocolate, but it isn’t overly sweet. It’s nice to let the peppermint flavour shine through. Chocolate and peppermint is such a classic Christmas flavour combination and whilst we usually eat it together in cookies or brownies, all these cold nights we have been having have had us craving hot chocolate and we have been experimenting with different flavours. We have a spiced orange version coming up soon too! If you are hosting a Christmas party and want to have something festive and non-alcoholic to serve up, then these would be perfect. Equally, a little glug of baileys or something similar would go really well in this. One: Put the skimmed milk and coconut milk in to a pan and bring to the boil. Two: Stir in the rest of the ingredients and simmer for 5 minutes. 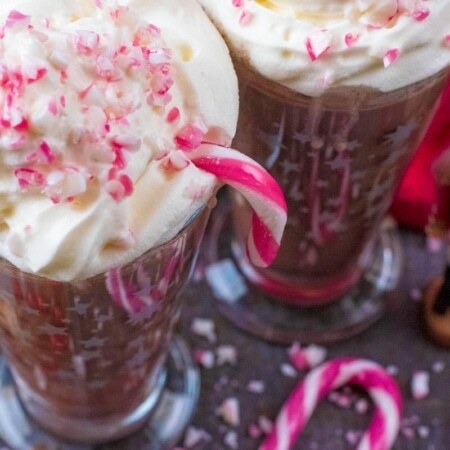 Three: Pour in to mugs and top with cream and crumbled candy canes. 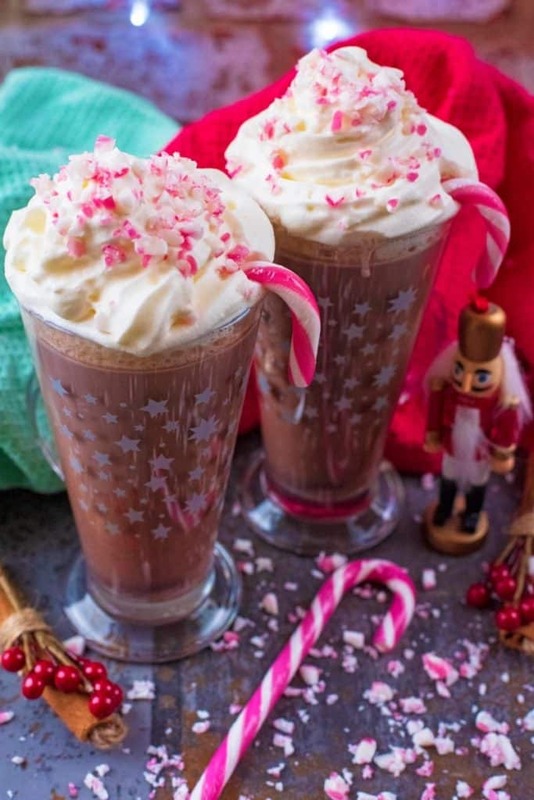 Use whipped cream and candy canes to make this hot chocolate a little more indulgent, or you can just leave them out. We used a mixture of skimmed milk and coconut milk, but you could use just skimmed milk to make this lower in calories. Want to keep this vegan? Use almond milk and swap the honey for maple syrup. 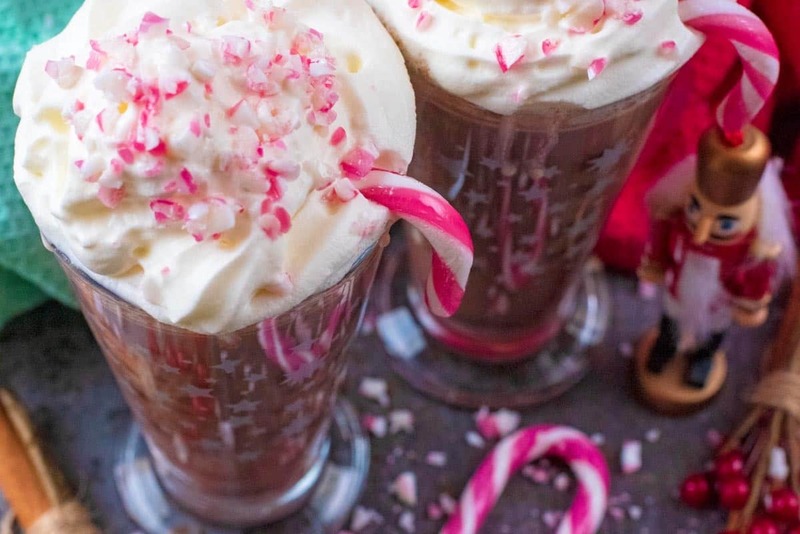 Do you want to be kept up to date on more delicious posts like this Peppermint Hot Chocolate? 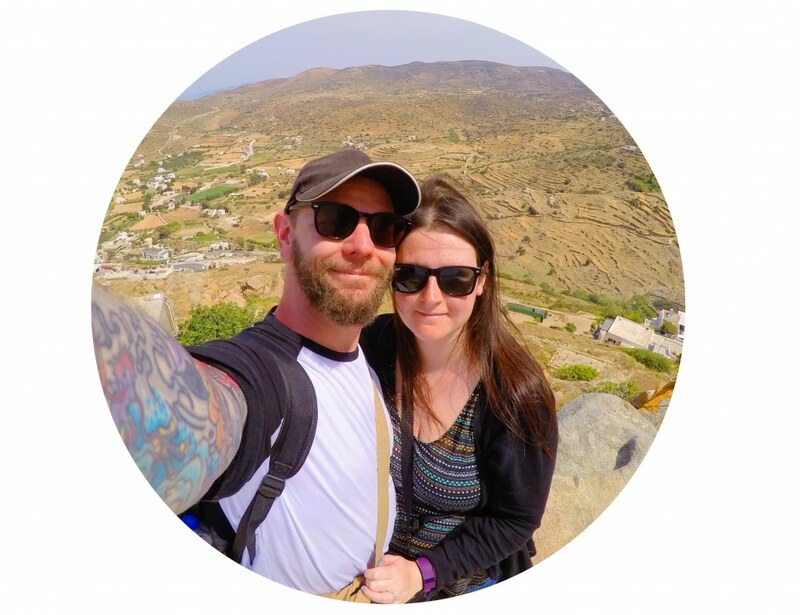 Please subscribe to the blog mailing list (it takes 30 seconds). 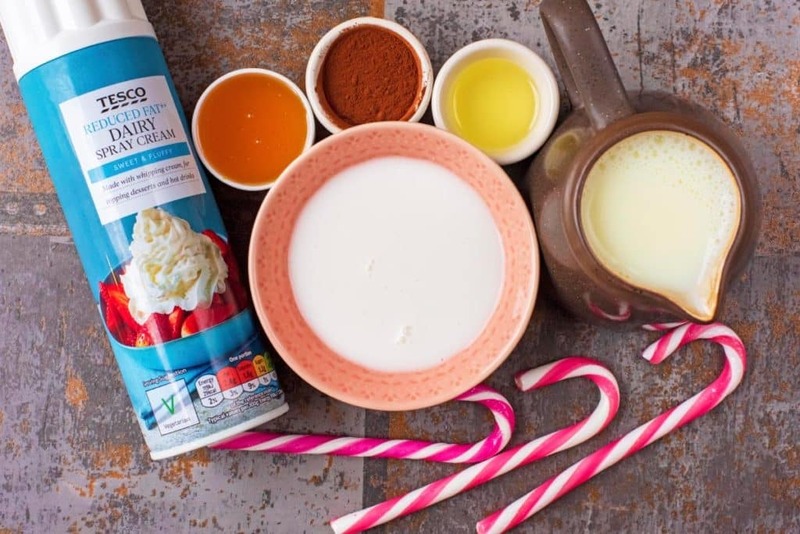 If you’ve tried this Peppermint Hot Chocolate, or any other recipe on the blog, then let us know how you got on in the comments below, we love hearing from you! You can also FOLLOW US on FACEBOOK, TWITTER, INSTAGRAM and PINTEREST to see more delicious recipe ideas, behind the scenes shots and also what we are getting up to. 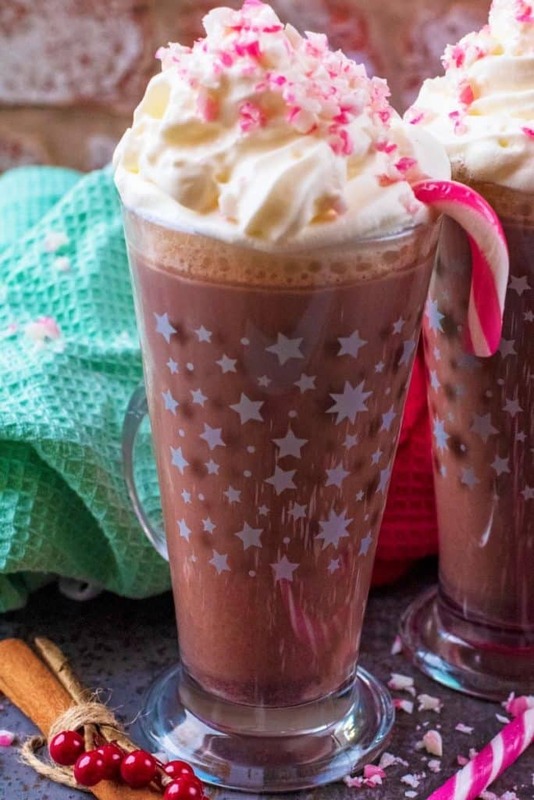 This lightened up Healthy Peppermint Hot Chocolate has less sugar than most. That hint of peppermint is sure to get you in the festive mood. Pour the Milk and coconut milk in to a saucepan and bring to the boil. Stir in the remaining ingredients and turn down to a simmer for 5 minutes. Pour in to mugs and serve. Hot chocolate is my go to hot drink in winter and I love tasting new flavors. This one sounds delish! Yum! It’s currently 4 degrees outside in Boston so I feel like I need this in my life. Love that you used honey to sweeten them. I love this recipies. It looks so delicious. Thanks for sharing it. Keep posting for morr. Brilliant combination of flavours for a hot chocolate. I love festive hot drinks. Nothing says Christmas like a minty hot chocolate, I don’t think I’ve indulged in one this year so I will have to dig out the ingredients and add a little peppermint! 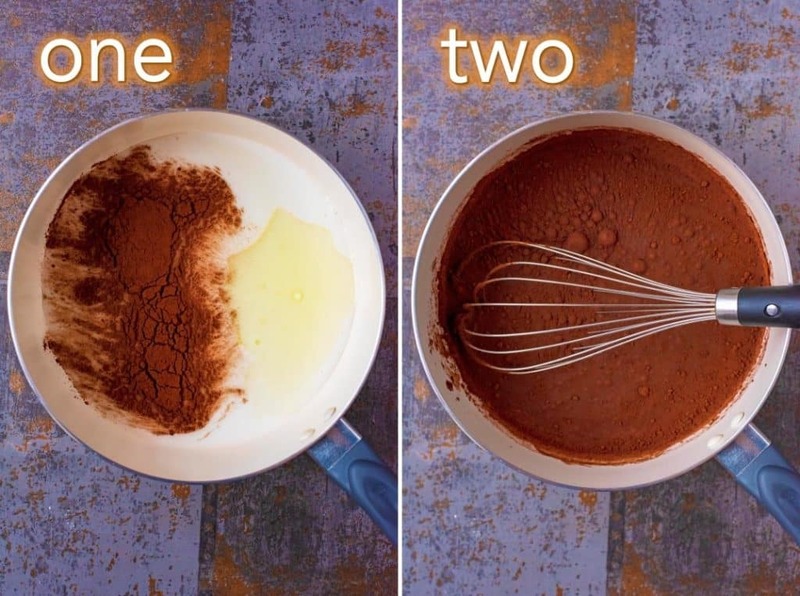 Lovely recipe!